Pitch Painter is a Morton Subotnick’s app for the Ipad, designed for kids from 3 to 5 year-olds. It has been realized for teaching goals, to help children to understand music through a playful approach. Morton Subotnick is an American composer, multimedia performer and an electronic music pioneer. Touch – Pitch Painter is based on a very simple idea: kids of 3-5 years old have a manual approach with the reality. So, a digital toy which allows them to express themselves with hands is a very powerful technological instrument. In this manner children can use their fingers as paint brushes, drawing graphic signs on the tablet surface. 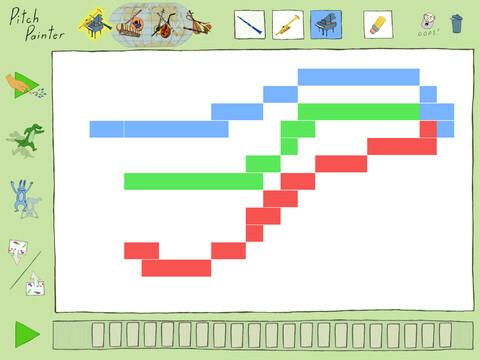 Pitch Painter is is a tool to entertain and for stimulating musical creativity in children, before they enter in a traditional teaching course of music. The Pitch Painter GUI. In high the instruments choice section. On the left some advanced functionality. Draw your music – Pitch Painter has a very simple and intuitive GUI. The child have, in front of him, a sort of digital paper, on which he draw his musical score, to perform by pressing the play button. From this point of view, Pitch Painter is a sequencer that perform the musical part once or loop. Timbres – Another interesting feature concerns musical tones. On the top left of the GUI, the child have 4 elementary icons representing traditional instruments of 5 world regions: Europe and North America, West Africa, Middle East and East Asia. Every group is represented with 3 different instruments. Choice menu for traditional instruments. 3 or 4 voices? – The traditional instruments offer not only different tones, but allow also to compose music for various parts, since the Subotnick’s software allow user to use simultaneously each of different instruments. Reverse, Flip, Save – Among other interesting features, we find Reverse, Flip and Save. The first allows you to perform the graphical score from right to left (Reverse Mode). Flip is a command to invert the entire drawing, so the descendent part becomes ascendant and vice versa. Saving your drawing is also a very important command, to listen (through the Load button) in every moment the graphical score realized with Pitch Painter. Pitch Painter was released on May, 2012. Even today is available only for iPad, not free but for 3.99 $. we also remember the technical staff composed by Sandra Stauffer, teaching guidance, Allen Roda, ethnomusicological guidance, and Morton Subotnick, that in previous years had produced a famous Cd-Rom series for musical teaching: Making Music.